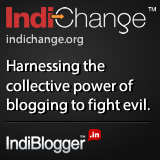 THE IDLE MIND: WHY INDIAN BLOGGERS SHOULD JOIN INDIBLOGGER? WHY INDIAN BLOGGERS SHOULD JOIN INDIBLOGGER? Blogging may be fun but it can also be a lonely and unrewarding job. Especially in the beginning . I once started a blog and deleted it within a month. Why? Well, there isn’t any point if no one is going to read it, right? That can be pretty demoralizing for a beginner. You see, it doesn’t matter if your work gets criticized. But it is unbearable when your work is ignored. This is my second shot at blogging and there is one thing that I realized. The best way to keep yourself interested in blogging is by joining Google or blogging communities. IndiBlogger is the one of the best blogging communities in India and there are three good reasons for joining in it. I call it the 3Cs. IndiBlogger can be a real confidence booster. Our fellow bloggers are like-minded people who share a passion for blogging and are ready to encourage beginners like us. The IndiVotes is a plus point. It helps us know that someone liked our blog. This can be a real morale booster. Every blogger faces a situation when he/she does not know what to blog about. He/she may run out of ideas. IndiChange gives us a cause to blog about. It brings to us certain social issues that require our attention and encourages us to blog about them. At the end of the day, there is nothing more motivating than contests. IndiBlogger always has a contest going and there are tremendous prizes to be won. You may not get the top prize but there are prizes even for No.75 and some contests even have assured prizes. So, what are you waiting for? Join IndiBlogger. Enjoy Blogging.